A dynamic mesh is an object that represents a collection of vertices, edges and triangular faces (organized in polygons) defining the object's geometry that can be modified procedurally. It has all the static meshes' shader functionalities, so you can load an existing static mesh as a dynamic one in order to modify it. It is usually used to modify the mesh instance because of interaction (impact, shot, tear-out, etc.) or, for example, to create dynamic changing surface: cloth, rope, wire, liquid and so on. 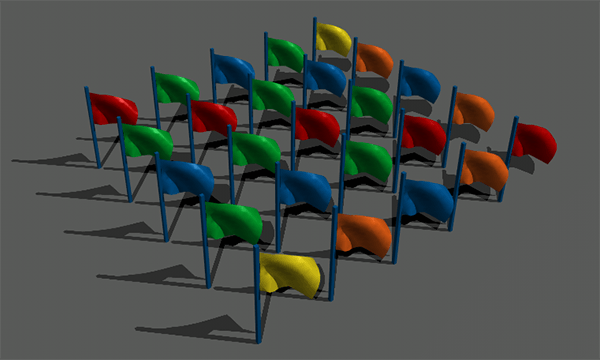 Dynamic meshes can be procedurally created by using Unigine or third-party plugin or library. The max number of surfaces organized in hierarchy for dynamic mesh is 32768. On the Menu bar, click Create -> Object -> Mesh Dynamic. In the dialog window that opens, choose the path to the .mesh file. Place the mesh somewhere in the world. 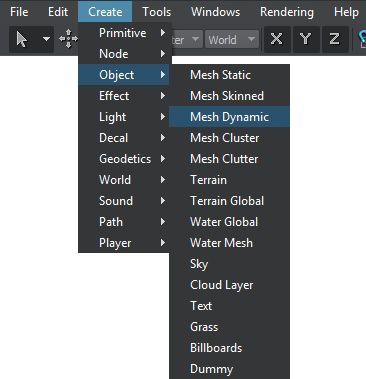 You can change the path to the mesh at any time in the MeshDynamic tab.